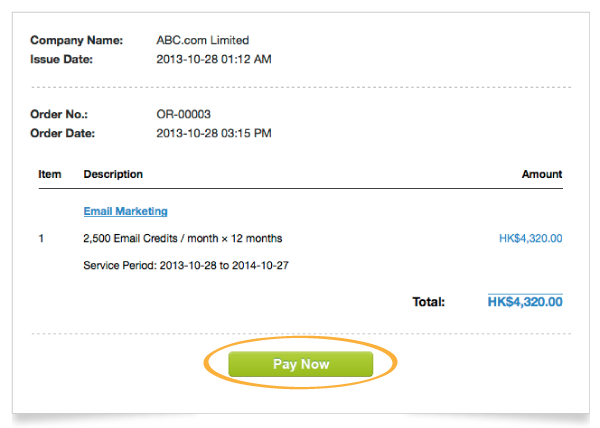 Click the [Pay Now] button in your invoice email to pay the bill. It will direct you to the Paypal payment page. You can choose to pay with your credit card or your Paypal account. 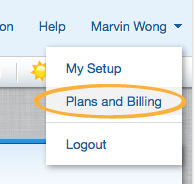 In system, select [Plans and Billing], then select [Order History]. If your order status is [Accepted], you can view all unpaid invoices in Unpaid Invoice panel. Click the [Pay Online] button to pay each. If your order status is [Received], you can also click the [Pay Online] button in Order History list or the same button within any Order Details page for order settlement. Mark the [Invoice Number] on the back of the crossed cheque payable to SalesCatalysts.com Limited. Send your cheque at least 3 working days before due date to avoid postal delay. Send an empty email with subject [Invoice No. XXXXXXXX Settled] to account@salescatalysts.com; or Mark the Invoice Number on your bank remittance / transaction slip and fax it to +852 3598 6780.